Liverpool is the perfect place for Luis Suarez according to manager Brendan Rodgers after the striker scored four goals in the 5-1 win over Norwich. Suarez wanted to leave the club in the summer, but stayed and has since scored 13 goals in 10 games this season. "He is really happy here. He is playing with a smile and enthusiasm," said Rodgers. "The whole profile of the club fits him perfectly. The supporters idolise him and you can see the connection there." The Uruguayan is part of a 23-man shortlist for Fifa's Ballon d'Or for the world's best player that will be awarded on 13 January, and Rodgers believes he is up to the standard set by Real Madrid's Cristiano Ronaldo, Barcelona's Lionel Messi and Bayern Munich's Franck Ribery. "Everything about him is just world class," added the Northern Irishman. "If you look at the world-class performers at the top of the game their numbers are just exceptional and that is the level he is at. "To miss the first four games of the season and to be on the number of goals he is now is a wonderful return. "The football suits him here. We try to play a certain way that allows him the freedom to move and to create the spaces for him to exploit." Suarez claimed in August that Liverpool had reneged on an agreement to let him leave if they failed to qualify for the Champions League. Arsenal had two bids, the second a pound more than £40m in an attempt to trigger a clause they believed was in the 26-year-old's contract, turned down for Suarez. 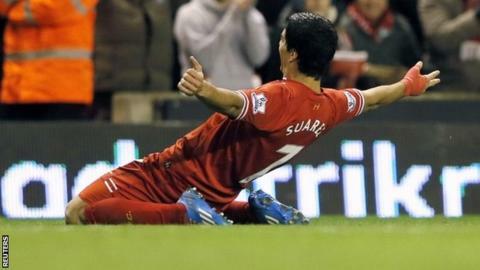 "I feel I have done enough to be playing in the Champions League at this stage of my career," Suarez said at the time. "Now there is an option for me to do that and I want very much to take it." Liverpool currently lie in the last of the Premier League top-four spots that would guarantee Champions League football next season, but face testing trips to Tottenham, Manchester City and Chelsea before the end of the month.